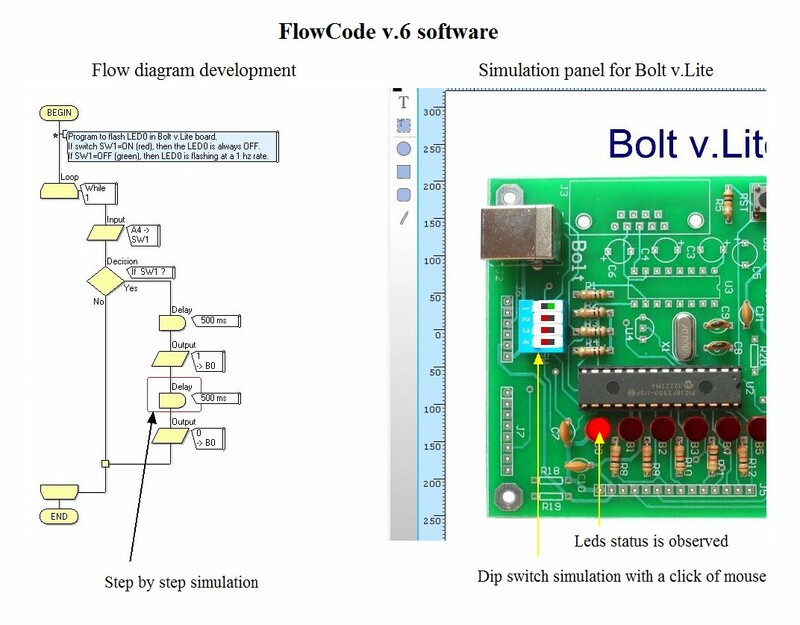 FlowCode v.6 software for program development using flow diagrams, with Bolt v.Lite board. First, install FlowCode v.6 (demo version) in your computer. Flowcode v.6 software is a graphical programming interface that allows you to develop applications on the Bolt v.Lite system, or any other microcontroller system based on PIC micro using only flowcharts and without the need to program in high level languages ​. The software has the necessary tools to implement the flowchart and define graphical components such as LEDs, dip switches, LCD, keypad, RS232 ports, etc. Additionally, Flowcode has an integrated simulator, so that you can simulate your program in real time, observing its outputs and changing its inputs on a simulation panel (dashboard). The simulator can also operate step by step. See the example shown in the image above: on the left side the user constructs the flowchart and, on the right side, the simulation panel (dashboard) of Bolt v.Lite system is ready for simulation. During simulation, user may change the status of any of the dip switches with a click of the mouse over the panel. Once you have the application successfully working in the simulation program, Flowcode has a C compiler to generate the .hex executable file. 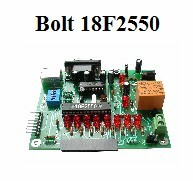 The latter can be loaded directly into the system Bolt v.Lite system, or any other PIC microcontroller based system. The FlowCode software can be used by students and teachers, as a powerful tool for learning or teaching programming of PIC micro systems in high level languages. The Flow charts are easily developed by means of a simple drag and drop menu. Once the flow chart is terminated, the user may simulate the program, and see in real time -on the simulation panel- the LEDs flashing, and can at the same time operate the dip switches to open and close with mouse clicks. 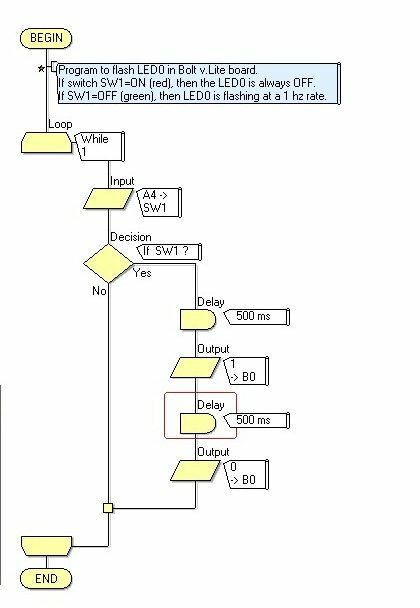 You can also perform a simulation step by step, being highly didactic to follow the program flow diagram, while observing the operating components (leds, dip switches) functioning. Also provided in the simulation screen is a diagram of the 18F2550 chip (or the microcontroller that has been defined) with its pin assignment. In this diagram, the user may observe the bits of the input and output ports activated during simulation. 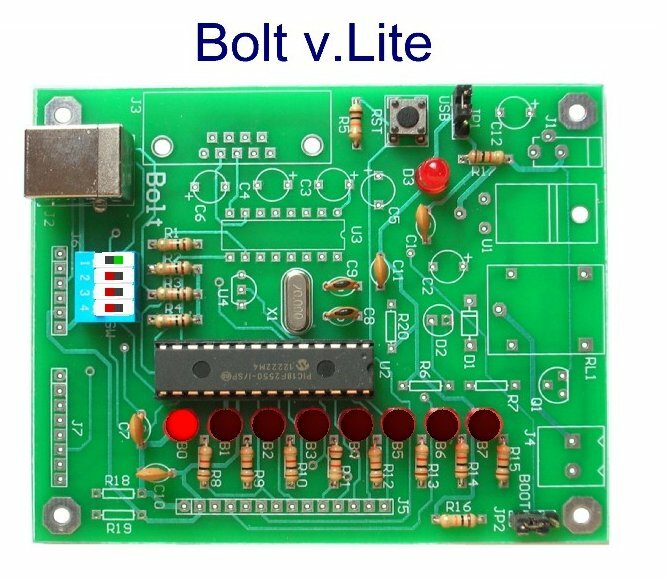 Finally, once the user has the program functioning correctly, he/she may compile the diagram, generating an executable (.hex) file, which can be loaded into the system Bolt v.Lite board. 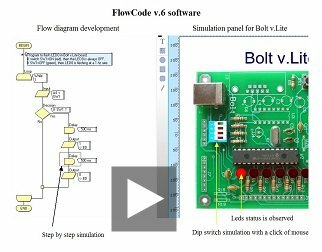 We recommend you to download the demo version of FlowCode v.6 with which you can develop your own flow charts and operate the leds and microswitches of Bolt v.Lite system. Flowcode has options to operate in different languages. We provide a FlowCode template folder for Bolt v.Lite system including a simple test program, as shown in the image on the left. In this test example, the system performs a blink of LED0 if the dip switch SW1 is OFF. Alternatively, the LED0 remain in off state if SW1 is ON. The first is a .c file containing the program in ANSI C, the second is a .asm containing the assembly language program and the last is a .hex that is the executable file directly compatible with Bolt v.Lite board. 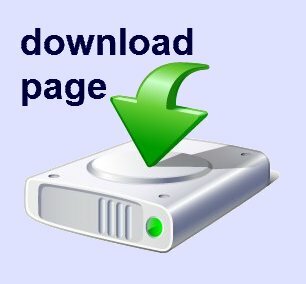 See contents of this folder on the image below. 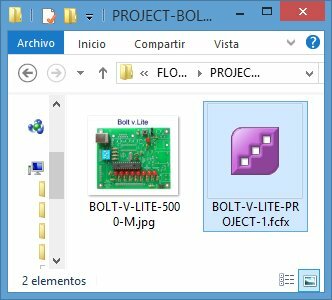 You must open the FlowCode v.6 project file: BOLT-V-LITE-PROJECT-1.fcfx (ícon in purple color). 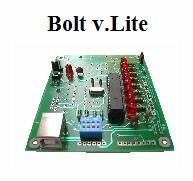 Once the flow diagram is compiled, as shown in video, the .hex file may be directly loaded in Bolt v.Lite board using the programming software. The folder with the template files provided for the Bolt card includes the flowchart for the test program explained above, and also the simulation (dashboard) panel shown in the image on the left. During the simulation, the user can see in the graph (dashboard), in real time, the behavior of the LEDs. Similarly, by a click of the mouse he/she can change the status of any of the 4 dip switches. After the simulation, the user can load the executable file on the Bolt card and observe exactly the same result as observed in the simulation. Download Flowcode V6  free demo version here! All tests shown in this tutorial were made using FlowCode v.6 version.